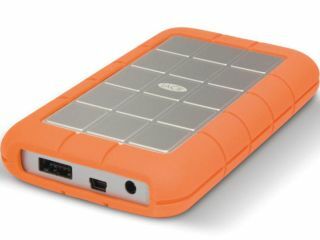 LaCie has released its latest mobile hard disk drive from tech slumber – the Rugged eSATA. The drive has the enviable boast of being the only portable, bus-powered eSATA solution on the market – offering up fast data speeds and a chassis that's more rugged than Gerard Butler with a week's stubble. The case protects the innards so much that you should be able to drop it from a height of 2.2 metres without your hokey collection of Entourage episodes becoming corrupted. This is because the case has been constructed out of scratch-free aluminium wrapped in rubber. Transfer times are a superb 90Mbps. The Rugged eSATA will be available in just one capacious flavour (500GB) and can be yours for the not-too-shabby price of £130. Go to www.lacie.com/uk for more details.